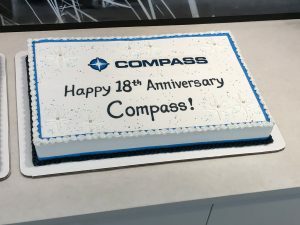 Home Blog Compass Celebrates 18 Years in the Energy Industry! Over the last 18 years, our industry-renowned leadership team has successfully steered Compass through the highs and lows of the industry, and has evolved the business from Compass Compression to Compass, a diverse company that offers five complementary business lines: Compression, Process, Retrofit, Rentals and Parts+Service. Designing and building our new state-of-the-art-facility: Frontier; an 80,000 square foot purpose-built facility that efficiently and cost-effectively provides our customers with single-source solutions. Launching our new Process Division in 2015. Rebranding our company from Compass Compression to Compass in 2018. Expanding our global footprint into Australia and the Middle East. The last 18 years has seen Compass evolve and grow into one of the most experienced, capable and customer-focused compression and process package companies in the oil and gas industry.